The heroes back home deduce that Darkseid is the best bet for the cause of the power dampening, which does end up including Aquaman’s telepathy. The solution is a gelatinous “fractal armor” that molds itself to the user and replicates their powers. Blue Beetle and Gypsy are the only ones among the assembled without superpowers or at least aren’t as reliant on them and will be delivering the armor, not aware that Robin is also there. He’s saved by Batman. Aquaman discovers a series of underwater caves that lead the potential source of the power dampening and the dead sealife, just as Beetle and Gypsy arrive with the armor. Kyle decides to give Robin his armor because he feels useless without his power ring. Batman, Robin, Aquaman, and Flash go into the caves while the other are attacked by a parademon who is able to talk and calls himself Mike (after Michael, “he who is like God”) who ejects the others and tries to kidnap Green Lantern until he manages to escape. Meanwhile, Flash and Aquaman each see visions that convince them to remove the armor but Batman manages to see through and warns Robin, who is seeing a vision of his own. Or is that the real Darkseid? 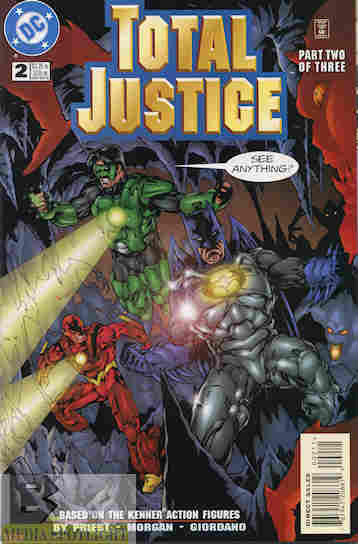 What they got right: While part of me gets JLA: Act Of God flashbacks with how Wally and Kyle react to losing their powers (Wally’s being understandable because he maintains his altered perception of time), I give the heroes credit for trying to come up with solutions, and after the fight with Mike Green Lantern at least appears to be going for his own armor. Mike is an interesting conundrum if you know anything about parademons. At the time I only knew them via the last two seasons of Super Friends/Super Powers Team, but I was able to keep up. And although he won’t shut up, he has a fair reason for it. What they got wrong: How did Mike know to drop those orbs that convince them to get rid of armor they only invented just now to deal with this crisis? And remember this was supposed to sell DC action figures with the fractal armor gimmick. Outside of Wally getting his superspeed back until “Barry” convinces him to remove it in such a short number of panels really doesn’t do that. Recommended: While I’m not a huge fan of Priest’s style (wait until I get to his Steel run), it’s not a bad story but it’s not one I’d urge you to run out and hunt down. Posted by ShadowWing Tronix on March 12, 2018 in DC Spotlight, Yesterday's Comics and tagged Aquaman, Batman, Blue Beetle, DC Comics, DC Universe, Green Lantern, Gypsy, Kyle Rayner, Mike the parademon, Robin (comics), The Flash, Tim Drake, Wally West.